Water heaters heat up commercial and residential buildings via a storage system and are run on gas or electricity. They facilitate the instant outpouring of hot water, and in short, are responsible for easy access to and the maintenance of hot water. However, water heaters require some maintenance themselves, particularly when issues arise. As water heaters have expected life spans of 8-12 years, steady maintenance best practices can contribute to longer usages. To maintain an orderly and efficient water heater, it’s important to implement some maintenance best practices. Learn how to drain a gas or electric water heater and discover common issues that crop up and how to repair them. These issues occur within the upper heating element, the pressure valve and the tank. Here’s what you need to know about them. The two main power sources for water heaters are electricity and gas. Before either system is connected to the power source, several precautions must be taken as maintenance practices. This is because turning the power on alone can have adverse effects on the heaters. Burnout of the upper heating element is a common issue with electric water heaters. It is caused when the power is turned on before the tank is fully filled with water. That can have a very negative effect on the heater because there won’t be any additional hot water until the upper element gets replaced. Therefore, the key is to turn the electricity on only when the tank is completely full of water. With gas-powered water heaters, turning on the system requires lighting the pilot, or producing a flame to get the system to a pilot mode. Lighting the pilot involves calibrating the gas valve to the “on” position and setting the control knob at “pilot.” The knob should be pressed and the igniter pushed. This will result in a light blinking and a small flame. The temperature must be set to 120 degrees Fahrenheit. Note: The first time a gas water heater is lit condensation may occur, visible by a water mass in the drain pan or by dripping noise. This is normal and will be gone when the heater reaches its optimal operating temperature. Gas and electric water heaters alike possess pressure valves or temperature and pressure relief valves (T&P valves). These safety devices provide apertures for the storage tank in case it over-pressurizes at150 psi and overheats at 210 degrees Fahrenheit. The extra water can safely be released instead of coercing excess pressure and temperature on the heater. An indication that the water heater is working properly is the absence of discharged water in the T&P valve. If the valve does discharge water, it is a sign there is a problem with the heater. Besides excess system pressure, its cause can be attributed to thermal expansion, low temperature relief, high settings on the water heater or a problem with the valve itself. If the valve is not working properly, it can cause the tank to explode. Turn off the power on the water heater (gas or electricity). Also, shut off the cold water inlet. Relieve the valve of excess liquid by placing a bucket to catch the water. Pull the trip level located on the valve and expect vapor and water to come out. If they don't, the valve should be drained and replaced. 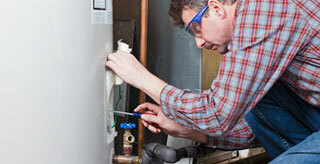 Take out the valve's discharge pipe and unscrew the valve from the water heater to remove it. Screw a new valve into place with a wrench, and reattach the discharge pipe. Either restart the pilot light or turn on the electricity based on your water heater type. As the largest component of the water heater, the tank is subject to sediment buildup. In large quantities, the sediment buildup clogs water lines. It’s also detrimental to the water heater as a whole, as it reduces energy efficiency. Solid maintenance requires flushing the tank every time the pressure relief valve is checked. Turn off the power (gas or electricity). This will extinguish the pilot. Turn off the cold water inlet. Use a garden hose to position it with the tank's drain valve. Place the hose's draining end in a space that won’t be ravaged by searing hot water. Open the relief and drain valves to drain out the tank entirely to remove as much sediment as possible. Close the tank's drain valve, the pressure relief valve and disconnect the hose from the drain valve. Turn on the cold water inlet. Also, open the hot water spigots. When water is released from each spigot, close them all, and then turn on the power. Turning on the water tank with precaution and maintenance of both the storage tank and temperature & pressure relief valve is crucial toward overall water heater maintenance. However, there is something else important to consider: leakage. Leaks can be avoided by flushing the tank and replacing the drain valve. Many leaks are also caused by erroneous water supply connections. To correct them, it’s best to use the right materials such as compression fittings. Copper pipes can also be used and must be soldered in. Further water heater maintenance best practices involve: maintaining 2 feet of clearance around the heater so that nothing obstructs it. Calibrating the thermostat to 120 degrees can save up to 5 percent in energy costs and helps to reduce scalding. Inspecting the sacrificial anode rod every three years will ensure proper rod upkeep. Adherence to these maintenance tips will result in fewer issues with water heaters and allow for longer shelf lives.